Join us for our 21st Annual Open House event this Saturday! 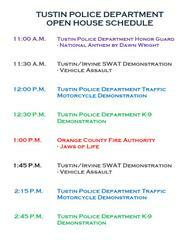 Come on out to our 21st Annual Open House event this Saturday, June 17th, from 11:00 AM to 3:00 PM. It’s free and lots of fun for the entire family! 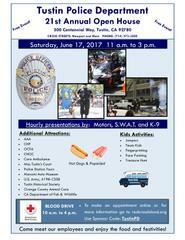 There will be games, food, and demonstrations by motor, canine, S.W.A.T., and the fire department (see attached photo for demo schedule). Take a tour of the department, visit with the California Department of Fish & Wildlife, the Tustin Historical Society, and kids can go on a Treasure Hunt. A few new exhibitors will be joining us this year. The Orange County District Attorney’s Office will introduce their GRIP (Gang Reduction Intervention Partnership) program along with their eye catching vehicle. There will also be a display of Orange County law enforcement uniforms from over the years. Some of our old favorites will be returning such as the military and Orange County Vector Control. Everyone is invited to attend this free event. Visit with our various police units and our personnel. Here’s a chance to learn more about the people who protect our City. Have a free hot dog lunch. Bounce houses and face painting will be part of the event. We look forward to seeing you at this fun, free, family event!